UPDATE: Shortly after reintroducing Kevin Saiz to college coaches via www.d1nation.com his dad Marty asked me to make a call to recently hired Eastern New Mexico Coach Stott Carter, an old friend of mine Kevin was quickly offered a scholarship to play in his home state of New Mexico. The Danny Granger D1 Ambassadors alumni and starting guard will be an excellent addition to Coach Carter as he builds the ENM program. Congratulations Kevin. The D1 Nation Family. 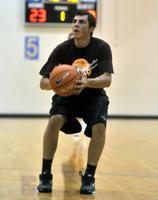 I've watched 2014 AVAILABLE guard Kevin Saiz for several years now. He's a half step slow for Division One basketball but what I love about him is he's constantly working on his craft and becoming a better player at a methodical, steady pace. Saiz has improved his body, his handles, his shot and also raised the level of his competitive streak in becoming a very good player. He's also solid academically and is a qualifier. Kevin has spent his entire club career with the Danny Granger D1 Ambassadors Elite squad. As an understudy to Bryce Alford (UCLA) and Cullen Neal (New Mexico), Saiz understands the game, how to be a floor general and when to make his own offensive statement. Kevin will make a fine NAIA or NCAA D2 player who'll be a solid contributor, and improve the character and play of any team which added him. 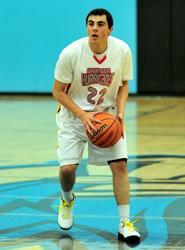 He's got nice court vision and can move to the off guard spot and be dangerous because of his catch and shoot skills.